Complete remodel and new furnishings! Welcome to your beach paradise! We are located 150 steps to beautiful Crystal Beach in East Destin. This is a well situated 2nd floor unit - featuring a large balcony with ocean views, also overlooking the pool. New flooring and paint make you feel right at home. 4 Smart TV throughout the unit - allowing you to access Hulu, Netflix, etc! Seasonally heated Pool & Hot Tub. Grand Caribbean West is located in the heart of tranquil Scenic 98 in Destin. A 3 minute walk to the beach. Several stores and restaurants are within a short walk. --This condo is not available to rent to anyone under the age twenty-four (24). All persons under the age of twenty-four (24) must be accompanied by a parent at all times. • Pool and door codes and wifi password will be emailed to you the date of your arrival. Check In is 4:00pm and Check out is 10:00am. I had never been to Destin, so I brought my two sons and my two nieces.. They were iffy when we pulled up, and I wanted to surprise them about the inside. All of them were very impressed, it was very clean, upto date, perfect from top to bottom.. It was nice with the porch being right close to the pool, the kids enjoyed that and the hot tub. The owners were extremely nice.. I cleaned up the place as I had arrived, just common curtesy! We will definitely been reserving this unit again..
We arrived for our vacation to a wonderfully up to date condo. The owners have thought of everything. The TVs on the bunk beds were great for our children. All they had to do was login to their accounts. The furnishing looked like there should’ve been in a million dollar home. The condo is well located. I could drink coffee on the porch and see the ocean. To get to the beach took no time. Maybe 2 minutes! 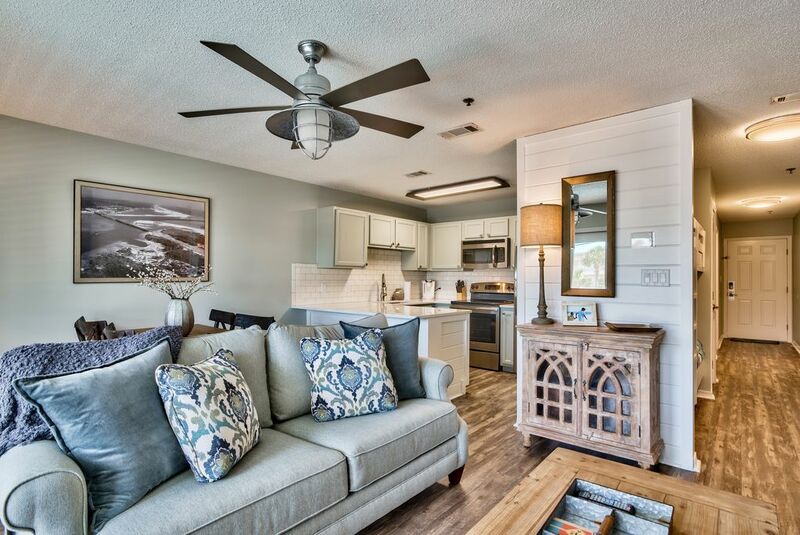 I love the Crystal Beach area of Destin and this condo is in the perfect spot! I would highly recommend this condo to any one looking for a luxurious place to stay! My husband and I stayed here the summer of 2018. We booked through VRBO for a last minute get away. Looking at the pictures I assumed this was a brand new rental. That was not the case. The pictures were accurate to the furniture but the rental was not as clean as I thought it would be. The floors were dirty, the baseboards were filthy and the white rug in the bathroom was pretty much brown. I was so grossed out by the rug that I put it in the closet throughout our stay. The handle to the door in the bedroom going into the bathroom fell off. We didn’t use the bunk beds, thankfully, bc the paint was all chipped off and the bedding looked dingy. The building is a older. I will say the kitchen was fully stocked with dishes and cooking utensils that were in great condition and I did like the decor. The floors, besides being dirty, looked newer. Beach access is right across the street but that area of the beach was super crowded. We drove down to Pompano Joe’s almost everyday and used that beach access. Overall this rental was ok. Not sure I’ll book here this year. My fiancé and I decided to book a trip to Destin for some last minute relaxation. Our condo options were limited as most places were reserved. We decided on this one because it looked nice in the photos, and my fiancé liked that it had large TV's in the living and bedroom. I felt the price was high for it not having a full ocean view or beach service, but I talked myself into it. - The living room cable was not working. This isn't a big deal to me, but was a big issue for my fiancé. I emailed the owner who got back with me the next day saying he would have Cox come out. I messaged back to have him call my cell since we would be out and about that day. I also asked a question about whether the complex allows golf carts to park overnight. I waited for a response....and waited....and got nothing. He disappeared on me and the cable was never fixed. You can park golf carts in the lot by the way. I know that from finally finding someone who works for the complex and not an owner's response. - The condo is advertised as overlooking the pool like it is a good thing. Remember, the building is old and that equates to thin walls. We could sit in the living room and hear every scream from playing children. As the night went on we could hear every word of conversation from neighbors and people using the pool after hours. This includes a young man saying to his friend, "Dude, you can still see (insert name here)'s vomit from last night on the side of the pool". Yeah, that makes me want to swim. - The door handle from the bedroom to the bathroom absolutely will not stay on. It fell on my toes at one point. That was fun. Also, the toilet paper holder would not stay on. - The grossest part of the experience would be the water bug / roach looking creatures that we found at various times through the week. It really made me comfortable eating and sleeping there. I will definitely be back to Destin, but I will not be staying here again. My family found a larger, nicer, gated condo between Capt Daves and Pompano Joe's with unblocked, sweeping views of the ocean and only paid about $200 more than me. I quickly realized I definitely overpaid by around $700 when comparing the units. Overall the condo was nice and a great location. You literally crossed the street and you were on the beach. The cons were that the main amenities were lacking. Upon check-in the floors were filthy as if they had not been swept for weeks. It felt like half the beach sand was on the floor so we immediately began sweeping. Then upon pulling the sofa couch out to make the bed it was also filled with sand. So now on vacation we were breaking out the vacuum. The Tv's in the bunks, which my young kids were super excited about, were pretty much useless considering the Wi-Fi in the condo NEVER worked. Then early during our stay the Living Room cable went out. All of these complaints were sent to the owner. The only issue addressed was having the condo cleaned. We even called the cable provider ourselves in an attempt to repair the cable issue. Unfortunately they were not able to fix it remotely so the remaining 5 days there was also no TV in the living area. And while we make the most of our vacation it's nice to come in late nights and be able to let the kids relax and watch Tv or a movie etc. So considering we paid about the same as any other condo that did have these amenities I was unimpressed with the lack of attention to issues at the condo. Our family of four enjoyed the week in this updated condo. Kitchen was well stocked with updated appliances. The kids enjoyed the smart TVs in the bunk beds. Condo is just across the street from the beach and you can see the ocean from the balcony that also overlooks the pool area. We would definitely stay there again.